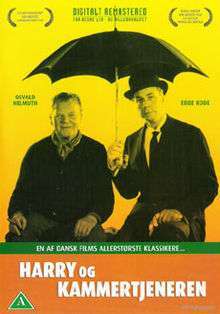 Harry and the Butler (Danish: Harry og kammertjeneren) is a 1961 Danish film directed by Bent Christensen. It was nominated for the Academy Award for Best Foreign Language Film. It was also entered into the 1962 Cannes Film Festival. ↑ "Festival de Cannes: Harry and the Butler". festival-cannes.com. Retrieved 2009-02-22.